Ford Motor Co. in Dearborn has introduced a Black Appearance Package for the all-new Ranger. It is available to order, and deliveries are expected to begin in early summer. 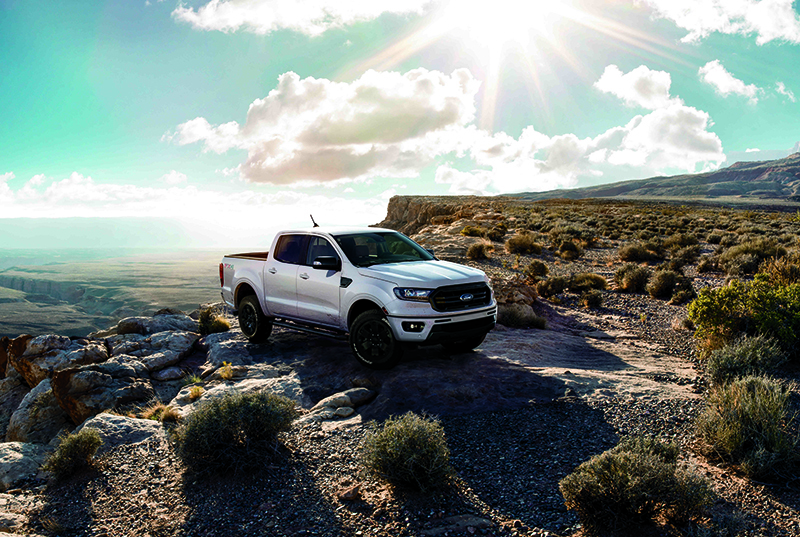 The Black Appearance Package for the Ford Ranger will be available this summer. // Photo courtesy of Ford Motor Co. The package is the pickup’s third style option, joining the Sport Appearance Package, which includes unique wheels and gray accents, and the Chrome Appearance Package, which has chrome wheels and accents. The package includes a black-painted grille, body-color bumpers, high-gloss black-painted 18-inch aluminum wheels with black center caps, black running boards, a black spray-in bed liner, a black fender vent surround, black mirrors, a black sill plate, a black bash plate on FX4 off-road package, and a black lower valance. The package is available as an option for $1,995, not including taxes. The Ford Ranger is a midsize pickup.